When it comes to golden foliage some of us just can’t get enough. These 10 favorites have been the best and brightest in the garden and will help your garden glitter with yellow and golden-colored hues. 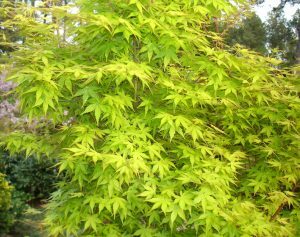 We know it is spring when the vivid gold palmate leaves of our ‘Katsura’ Japanese maple frame the patio garden. This is one of the first trees to leaf out so the radiant canopy commands attention. It does best in morning or filtered sun. ‘Katsura’ is stunning in fall turning bright yellow with orange tones. 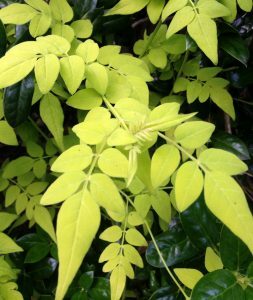 ‘Sun King’ aralia is a great new fast-growing perennial from Japan offering bold yellow compound leaves that light up a part-shade garden. It grows quickly to 3 to 4 feet and is deer-resistant and drought tolerant. ‘Sun King’ makes a brilliant tropical splash that is hard to resist. ‘Everillo’ is a bright and exciting new grass for shade with striking gold foliage. 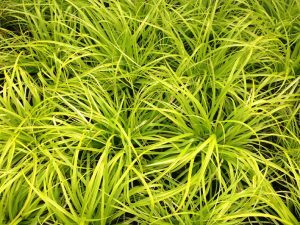 This evergreen sedge is a sport from the popular carex ‘Evergold’. Growing 1 foot tall by 2 feet wide, the plant is great as a single accent or en mass. In the shade garden, ‘Everillo’ is a fantastic year round grass that will grow on you. Try it in a container for great color. ‘Verdoni’ is a bright gold dwarf Hinoki cypress for sun or part sun. This slow-growing conifer has an appealing pyramidal shape with flattened horizontal branches. The dense twisting foliage is radiant in the winter garden. Reaching 3 to 5 feet in 10 years, ‘Verdoni’ is ideal for a container or that special spot at the front of the border. 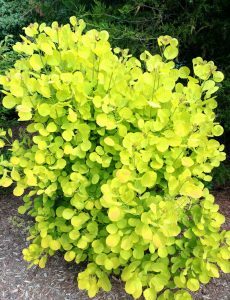 Golden Spirit is the bright yellow form of the more common burgundy smokebush. The foliage makes a big splash in the sun garden as it emerges lime green and matures to brilliant gold in the fall. This drought tolerant deciduous plant can be grown tree-form or kept pruned as a multi-branched 6-foot shrub. The beautiful round leaves absolutely glow in the garden. ‘Florida Sunshine’ anise is an elegant evergreen with bright chartreuse-gold foliage that is the perfect accent in part sun. 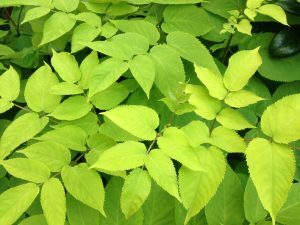 This medium sized deer resistant shrub was selected and introduced by Tony Avent of Plant Delights Nursery in Raleigh. Reddish stems become prominent in fall offering an interesting contrast with the foliage. This wonderful shrub grows to 4 feet tall and wide. Fiona Sunrise jasmine is our new favorite vine! It has gorgeous bright gold foliage that really stands out twining up our evergreen holly. Fragrant white flowers adorn this deciduous vine in mid-summer. Fiona Sunrise grows best in morning sun and will climb 12 feet in one season. ‘All Gold’ shore juniper continues to be our favorite low juniper in the garden. 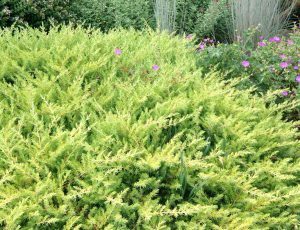 This fast growing conifer with bright yellow foliage reaches 1 foot tall by 4 feet wide in three years. 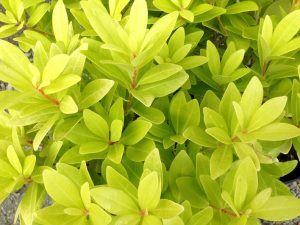 This colorful groundcover combines well with many shrubs and always makes the garden pop. 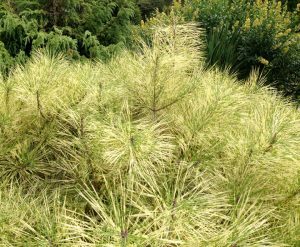 In our scree garden ‘Golden Ghost’ red pine is a standout. 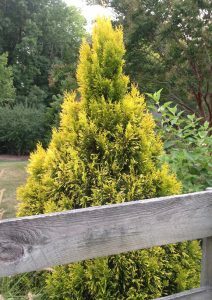 Visitors are drawn to this evergreen conifer with its electric yellow needles with subtle green banding. This dense slow growing pine will develop into a beautiful 6 to 8 feet tall specimen in 5 years. With sun and good drainage ‘Golden Ghost’ will become the center of attention. Resembling the flame of a large candle, Goldy arborvitae is a radiant conifer with perfect compact form. It is a very heat tolerant evergreen that thrives in full sun with good drainage. Goldy works well as a specimen in the garden or in a large container. This slow grower will take many years to reach its mature height of 15 feet.